Best British movies ever made: Michael Caine in Get Carter. Best British Movies of All Time? 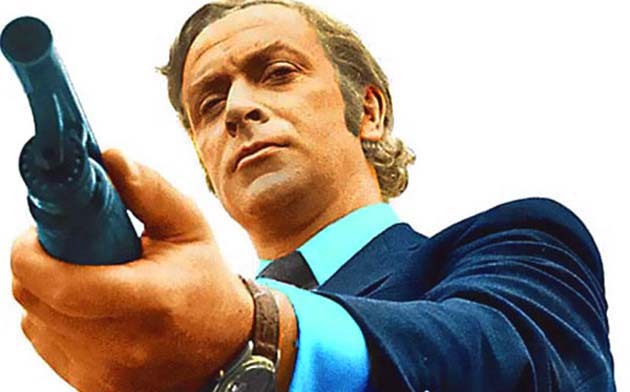 Ten years ago, Get Carter, starring Michael Caine as a dangerous-looking London gangster, was selected as the United Kingdom's very best movie of all time according to 25 British film critics polled by Total Film magazine. To say that Mike Hodges' 1971 thriller was a surprising choice would be an understatement. I mean, not a David Lean epic or an early Alfred Hitchcock thriller? What a difference ten years make. On Total Film's 2014 list, published last May, Get Carter was no. 44 among the magazine's Top 50 best British movies of all time. How could that be? Well, first of all, people would be very naive if they took such lists seriously, whether we're talking Total Film, the British Film Institute, or, to keep things British, Sight & Sound magazine. Second, whereas Total Film's 2004 list was the result of a 25-critic consensus, its 2014 list seems to have been the work of one single film reviewer, Paul Bradshaw. David Lean's Lawrence of Arabia (1962). Cast: Peter O'Toole. Omar Sharif. Alec Guinness. Claude Rains. Anthony Quinn. Arthur Kennedy. Carol Reed's The Third Man (1949). Cast: Joseph Cotten. Alida Valli. Orson Welles. Trevor Howard. Stanley Kubrick's A Clockwork Orange (1971). Cast: Malcolm McDowell. Patrick Magee. Michael Bates. Adrienne Corri. Michael Powell and Emeric Pressburger's The Red Shoes (1948). Cast: Moira Shearer. Anton Walbrook. Marius Goring. Stanley Kubrick's Barry Lyndon (1975). Cast: Ryan O'Neal. Marisa Berenson. Michael Powell and Emeric Pressburger's A Matter of Life and Death / Stairway to Heaven (1946). Cast: David Niven. Raymond Massey. Kim Hunter. Marius Goring. Robert Hamer's Kind Hearts and Coronets (1949). Cast: Dennis Price. Valerie Hobson. Joan Greenwood. Several Alec Guinness-es. David Lean's The Bridge on the River Kwai (1957). Cast: William Holden. Alec Guinness. Jack Hawkins. Sessue Hayakawa. Cast: Ewan McGregor. Ewen Bremner. Jonny Lee Miller. Kevin McKidd. Robert Carlyle. David Lean's Brief Encounter (1946). Cast: Celia Johnson. Trevor Howard. Lindsay Anderson's This Sporting Life (1963). Cast: Richard Harris. Rachel Roberts. David Lean's This Happy Breed (1944). Cast: Robert Newton. Celia Johnson. Stanley Holloway. John Mills. On the list above, we can see Hollywood's pervasive influence on the British film industry. Two of the listed “British movies” – A Clockwork Orange and Barry Lyndon – were backed by Hollywood studios and were directed by an American filmmaker, Stanley Kubrick, while the David Lean epics Lawrence of Arabia and The Bridge on the River Kwai were distributed and partially financed by Columbia Pictures. As for Carol Reed's The Third Man, it was a joint effort between David O. Selznick's U.S.-based Selznick International Pictures and Alexander Korda's London Films. Curiously missing from Total Film's Top Twelve Best British Movies Ever Made is another Stanley Kubrick effort, 2001: A Space Odyssey (1968). Perhaps the Metro-Goldwyn-Mayer release starring Americans Keir Dullea and Gary Lockwood simply wasn't considered British enough. Even though Barry Lyndon, starring Americans Ryan O'Neal and Marisa Berenson, was. Now, let's compare the 2014 Total Film list to the one published in Oct. 2004. Mike Hodges' Get Carter (1971). Cast: Michael Caine. Ian Hendry. Britt Ekland. A Matter of Life and Death / Stairway to Heaven (1946). Terry Jones' Life of Brian (1979). Cast: Monty Python (Graham Chapman, John Cleese, Michael Palin, Terry Gilliam, Eric Idle, Terry Jones). Robin Hardy's The Wicker Man (1973). Cast: Edward Woodward. Christopher Lee. Diane Cilento. Britt Ekland. Ingrid Pitt. Kind Hearts and Coronets (1949). Terence Young's From Russia with Love (1963). Cast: Sean Connery. Daniela Bianchi. Pedro Armendáriz. Robert Shaw. Lotte Lenya. Cast: David Thewlis. Lesley Sharp. Katrin Cartlidge. Ewen Bremner. Besides Get Carter, Total Film's other Top Ten surprises were Monty Python's Life of Brian, seen by many Christians as sacrilegious and by myself as an unfunny bore; the James Bond movie From Russia with Love; and Naked, a down-in-the-dumps psychological drama that beat better-known Mike Leigh efforts such as the Oscar-nominated Secrets & Lies and the New York Film Critics Circle's 1999 Best Film winner Topsy-Turvy. Movies produced and/or directed by British film industry torchbearers Alexander Korda (e.g., Rembrandt, The Four Feathers, The Thief of Bagdad) and Herbert Wilcox (Nurse Edith Cavell, Spring in Park Lane, Odette). Alfred Hitchcock's The Lodger a.k.a. The Lodger: A Story of the London Fog (1927), The Man Who Knew Too Much (1934), The 39 Steps (1935), and The Lady Vanishes (1938). Leslie Howard and Anthony Asquith's Pygmalion (1938) and Asquith's The Winslow Boy (1948). Michael Powell and Emeric Pressburger's The Life and Death of Colonel Blimp (1943), Black Narcissus (1946), and Michael Powell's Peeping Tom (1958). Alberto Cavalcanti, Basil Dearden, Charles Crichton, and Robert Hamer's Dead of Night (1945). Laurence Olivier's Henry V (1945) and Best Picture Oscar winner Hamlet (1948). David Lean's Blithe Spirit (1945), Great Expectations (1946), Hobson's Choice (1954), Summertime (1955), and A Passage to India (1984). Carol Reed's Night Train to Munich (1940), Odd Man Out (1947), The Fallen Idol (1948), and Oliver! (1968). Henry Cornelius' Passport to Pimlico (1949) and Genevieve (1953). Alexander Mackendrick's The Man in the White Suit (1951) and The Ladykillers (1955). Charles Crichton's The Lavender Hill Mob (1951) and A Fish Called Wanda (1988). John Huston's The African Queen (1951) – probably not considered British enough due to its American director and stars (Katharine Hepburn and Humphrey Bogart) though produced by the U.K.-based Romulus Films, which also financed Huston's Moulin Rouge (1952). Otto Preminger's Bonjour Tristesse (1958) and Bunny Lake Is Missing (1965). Jack Clayton's Room at the Top (1959) and The Innocents (1961). Ronald Neame's Tunes of Glory (1960) and The Prime of Miss Jean Brodie (1969). Joseph Losey's The Servant (1963) and The Go-Between (1971). John Schlesinger's Billy Liar (1963), Darling (1965), and Sunday, Bloody Sunday (1971). Stanley Kubrick's aforementioned 2001: A Space Odyssey (1968). Ken Loach's Kes (1969) and Land and Freedom (1995). Ken Russell's Women in Love (1969), The Boy Friend (1971), and Tommy (1975). Nicolas Roeg's Don't Look Now (1973). Stephen Frears' My Beautiful Laundrette (1985). James Ivory's A Room with a View (1986), Howards End (1992), and The Remains of the Day (1993). Kenneth Branagh's Henry V (1989). Terence Davies' The Long Day Closes (1992). Neil Jordan's The Crying Game (1992). Mike Leigh's Secrets & Lies (1995) and Topsy-Turvy (1999). Alfred Hitchcock's The 39 Steps (1935). Cast: Robert Donat. Madeleine Carroll. Peggy Ashcroft. Lucie Mannheim. David Lean's Great Expectations (1946). Cast: John Mills. Valerie Hobson. Alec Guinness. Finlay Currie. Martita Hunt. Jean Simmons. Cast: David Bradley. Freddie Fletcher. Lynne Perrie. Colin Welland. Cast: Donald Sutherland. Julie Christie. Hilary Mason. '2001: A Space Odyssey' British? And among the U.K.-based Sight & Sound magazine's most recent (Sept. 2012) Top 50 movies of all time, only one film could possibly be considered in any way “British”: ironically, that's Stanley Kubrick's 2001: A Space Odyssey. But it may serve as consolation that the no. 1 movie on the list, the 1958 Hollywood production Vertigo, starring James Stewart and Kim Novak, was directed by an Englishman: Alfred Hitchcock. As an aside: Get Carter suffered an American remake in 2000; directed by Stephen Kay, the critical bomb starred Sylvester Stallone. The Third Man hasn't been officially remade – despite threats in 2009 that Leonardo DiCaprio and Tobey Maguire would star in a reboot of Carol Reed's film. However, there was a The Third Man “homage” found in Martin Scorsese's 2006 Best Picture Oscar winner The Departed: the cemetery scene, when Vera Farmiga is seen walking past Matt Damon. To date, there hasn't been an official Lawrence of Arabia remake, but T.E. Lawrence will shortly be back on the big screen in the form of Robert Pattinson, one of the stars of Werner Herzog's Queen of Desert, also featuring Nicole Kidman as Gertrude Bell and James Franco as Henry Cadogan. Note: Following suggestions from readers, I've added a few extra titles to the above lists of best British movies of all time. Image of Michael Caine in one of the “Best British Movies Ever,” Get Carter: Metro-Goldwyn-Mayer. Trailers of Best British Movies Lawrence of Arabia, Get Carter, and The Third Man: Columbia, MGM, and Selznick Pictures, respectively. Great article!! Brought back memories of so many films I love, and so many I don't. Thanks for the list. Just added a trio of James Ivory movies to the article.